Right now could be said to be the time of the big phone, with models such as the Samsung Note capturing excitement and market share, but could 2013 be the year of the dual-screen phone? It will if the YotaPhone gets its way. The YotaPhone is from Russian company Yota Devices. The really interesting thing about this upcoming smartphone is that it is a dual-screen device. On top is your regular LCD screen, but on the back is not simply an additional screen, but an additional screen that is an electronic paper display, or e-ink screen. That’s the sort of screen favoured by devices such as the Amazon Kindle, so chosen because it is both easier for the human eye to read, and easier on battery usage. So on the LCD screen you could be browsing the web, playing games, looking at photos and so on, while on the e-ink screen you could be reading a book, checking the time, or… other things. 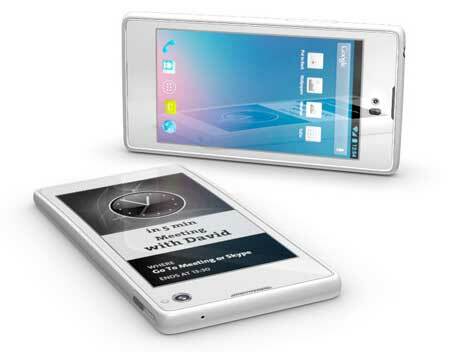 Yota Devices is planning to release an API to app developers to encourage innovative use of the e-ink side of the phone. Moving to other features, the YotaPhone will run the Android operating system, version 4.2, Android Jelly Bean. The screens, both of them, will be 4.3 inch, protected by Corning’s Gorilla Glass. Memory will be either a 32 or 64 GB Flash drive, with 2 GB RAM. Providing the juice will be a 2100 mAh battery, and for your photographic needs, a 12 megapixel main camera, and a HD front camera. Prototypes of the YotaPhone were seen at last week’s Consumer Electronics Show in Las Vegas, with a more complete version, with I expect more apps, to be shown at late February’s 2013 Mobile World Congress in Barcelona. 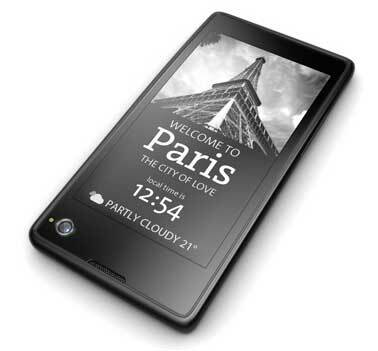 The YotaPhone is expected to go on sale in the 4th-quarter of 2013.